The Chronicles of Narnia has mesmerized generations of readers and millions of fans have raved about the blockbuster hit movies. Based on the blockbuster film series and C.S. 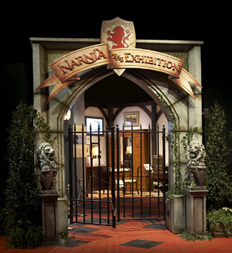 Lewis’ beloved fictional books, The Chronicles of Narnia: The Exhibition allowed visitors to tour the scenes from the famed literary world of Narnia. Through authentic costumes, props and set dressings from the magical films, visitors entered a three-dimensional world that combined the wonders of science with aspects of fantasy of this enchanting world. Visitors could catch a glimpse of artifacts from Lewis’ personal study and experience exciting environments such as the famous attic and wardrobe. Visitors encounted falling snow and other interactive and instructive elements, including a replica of the White Witch’s Throne, where guests could sit and feel the chill; and special areas featuring King Miraz’s Castle from The Chronicles of Narnia: Prince Caspian, where visitors hadthe opportunity to build an arch as well as create their own animals based on the mythical creatures featured in the film. This special exhibition was a truly captivating and entertaining experience for all ages. The Chronicles of Narnia: The Exhibition is produced by Exhibitgroup/Giltspur and is presented by Walt Disney Pictures and Walden Media.